By chance, I caught the first in a two-part documentary on BBC2 at the weekend – Speed Dreams: The Fastest Place on Earth and it completely gripped me. 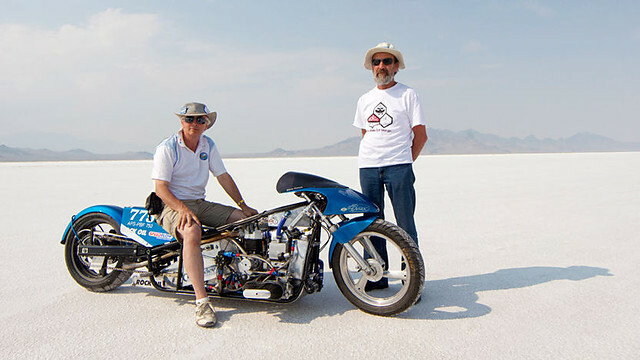 It follows a number of different amateur British engineers in their quest to build a vehicle fast enough to break a world land speed record and take it to the annual Speed Week at Bonneville Flats, near Salt Lake City, Utah. So what, I hear you cry? Well, I should point out that I have no interest in cars whatsoever. I never watch Top Gear, don’t know the difference between ‘torque’ and ‘talk’ and only own a car as a way to get from A to B (it’s a Ford Focus, for goodness sake). And yet, I was transfixed by Speed Dreams. And after I’d spent an hour glued to the screen, I stopped to ask myself how a subject I have no interest in could have grabbed me. The answer, as you might imagine, was quite simple. It was the brilliance of the content and, specifically, the stories of these passionate, obsessed and, in may cases, hugely eccentric men who have given up months and years in the pursuit of something they believed in. In the same way, the new BBC4 wildlife documentary, The Lost Land of the Tiger manages to tread a similar path – being compelling viewing even for someone who doesn’t necessarily normally watch ‘that sort of programme’. The uniting factor in both cases are the people and their ‘magnetism’ to the viewer. Although the shows have a good reason for being filmed – speed and animals – the reason they’re great viewing is that excitement, humanity and ‘realness’ of all involved elevates them above the norm. It’s exactly why so many brands are returning to brass tacks and trying to get ‘human interest’ into their everyday marketing. We’re all overrun with messages and advertising coming at us from every direction and need a reason to be engaged with something. It needs to stir the soul and tug at the emotions. That’s exactly why so many people mourned the loss of Christopher Martin-Jenkins recently (and continue to adore Test Match Special). His ability to put over his passion for cricket and set the scene for fans made him feel like a friend to the millions who have listened to him over the years. Returning to the TV, though, it was impossible to not feel the joy of Dr George McGavin in Lost Land of the Tiger, when he reached into a huge pile of elephant poo and pull out ‘the biggest dung beetle I’ve ever seen’. Now that’s the power of storytelling! Next Next post: Did Tesco get it right with its apology?